Relaxing in Naples, Florida is one of life’s simple pleasures, but the experience is greatly enhanced when the view from your porch is spectacular. Residents of Laguna at Fiddler’s Creek will testify to that. Situated in the northern-most point of the Veneta residential zone, and the very tip of the Fiddler’s Creek development, the Laguna community boasts not only homes that are of the highest quality, but also views that few other villages can match. 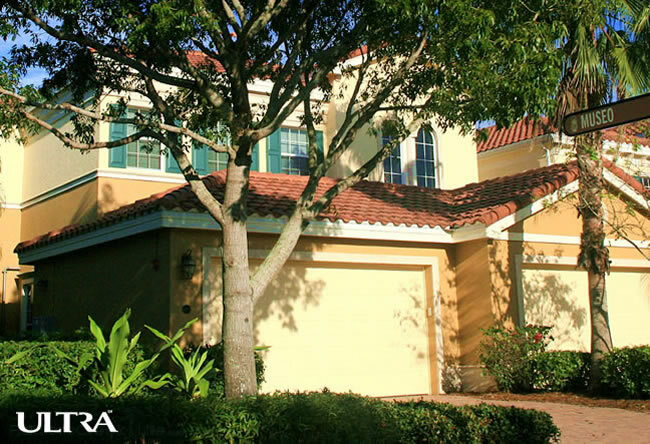 The village of Laguna at Fiddler’s Creek comprises 16 coach style buildings, each divided into eight distinct units to create a total of 128 Laguna condos. The buildings circle a single, horseshoe-shaped lake, facing outward to ensure that every resident can enjoy the beautiful lake view in homely comfort. Of course, the amenities available to Fiddler’s Creek residents add greatly to the quality of life there, with world-class cuisine, recreational facilities and social events available the club and spa center. But it is this view that makes the Laguna community so irresistible. Regina is a 2nd-floor condo totaling an area of 3,461 sq ft, with 3 bedrooms, 4 bathrooms (1 half), large family room, large screened lanai, and 2-car garage included in the floor plan. Monarca is a 1st-floor condo totaling an area of 3,164 sq ft, with 3 bedrooms, 3 bathrooms, living, dining and family rooms, large screened lanai, and 2-car garage included in the floor plan. Castello is a 2nd-floor condo totaling an area of 2,850 sq ft, with 3 bedrooms, 3 bathrooms, living, dining and family rooms, large screened lanai, and 2-car garage included in the floor plan. Carona is a 1st-floor condo and the largest Laguna condo, totaling an area of 2,859 sq ft, with 3 bedrooms, 3 bathrooms, living, dining and family rooms, large screened lanai, and 2-car garage included in the floor plan. For more details on Laguna at Fiddler’s Creek and life in the Laguna community, just scroll down for the current listings of call us.